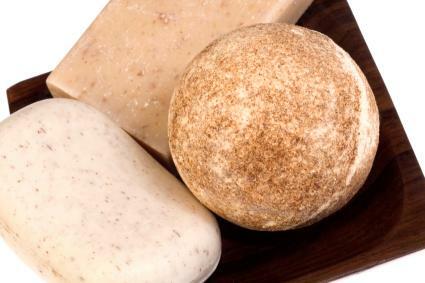 Bath soap has come a long way from the rough, lime-based soaps used by American pioneers. Today, you can indulge your senses in an aromatic lather with bar or liquid soaps, without excessive drying. The first thing that you need to ask yourself when it comes to purchasing bath soap is, what kind do you want? Since soap comes both in traditional bar form as well as in a liquid, you need to decide based on your preferences. Bars are great for men and women who lead busy lifestyles. These soaps are simple to use with reliable results. Liquid bath soap is a great find for a gift, as it often comes in imaginative packaging and in a variety of scents and variations. Unfortunately, for thousands of Americans, the concern is not what type of soap to use, but which products can be used as all. Some people can be moderately to severely allergic to common bath soaps, not to mention laundry detergents and kitchen or bathroom cleaning products. For the person who has an allergy, it is important to find a soap that will still be comforting and effective without becoming a major irritant. Allergy-prone people enjoy the quality of goat's milk soap, which is a mild formula that works great on sensitive skin. Others use baby soap, which is also perfect for sensitive skin thanks to its gentle formula. If you find that you get an allergy from your soap or any other skincare or cosmetic product, discontinue use immediately and see a dermatologist if the situation does not clear up on its own within a week. Determining your skin type will help prevent allergies or other surprise skin reactions to bath soap or any other skin products. If you have normal skin, then you are extremely lucky! This means that your skin has the perfect balance of moisture and oils, leaving you with the luxury of being able to enjoy all of the adorable scented and colored soaps out there without worrying about irritants. To keep skin healthy and glowing, make sure you cleanse it regularly and hydrate daily. Kiss My Face sells a nice line of liquid and bar soaps that will help maintain your ideal skin type without harsh lathers or overpowering fragrance. If you are rash prone or have skin that stings easily when using various bath products, then chances are you have sensitive skin. Sensitive-skinned folks often have to be extra careful with any bath or beauty products that they encounter, and it is usually wise to stick to organic, natural, or extremely simple soaps and cleansers. Neutrogena has silky, smooth skin soaps for sensitive soap. Finally, oily skin can compel people to cleanse more often and more vigorously. It is important to realize this is not good for your skin. Instead, you should try to use a bath soap specifically formulated for oily skin. Having oily skin does not mean that you have to scrub harder or more frequently. You just need to find a formula that works well for your skin type. Be sure to consider an anti-bacterial soap for daily cleansing. Reducing the bacteria on the surface of the skin helps to prevent future breakouts. Lever 2000 offers a liquid and bar formulation to help fight oil. Whether you prefer a lotion-like liquid or a bar bath soap, you'll find modern soaps luxurious and cleansing. Whether scented for a soothing, aromatic experience of richly lathering for a creamy treat, there are bath soaps available for all skin types.